Statistics 3 Edition Alan Agresti and Chris Franklin have merged their research and classroom experience to develop this successful introductory statistics text. 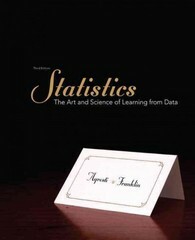 Statistics: The Art and Science of Learning from Data, Third Edition, helps students become statistically literate by encouraging them to ask and answer interesting statistical questions. It takes the ideas that have turned statistics into a central science in modern life and makes them accessible and engaging to students without compromising necessary rigor. The Third Edition has been edited for conciseness and clarity to keep students focused on the main concepts. The data-rich examples that feature intriguing human-interest topics now include topic labels to indicate which statistical topic is being applied. New learning objectives for each chapter appear in the Instructor’s Edition, making it easier to plan lectures and Chapter 7 (Sampling Distributions) now incorporates simulations in addition to the mathematical formulas.